Already this movement, us, we've already come together and affirmed our common humanity, our fundamental interdependence, our common desire to heal. And in that, no matter what comes November 4th, a majority of Americans, we are already healing. People say Obama’s words are just words, but when was the last time "words" weren’t important? When was the last time a great leader didn’t use words to lead? ... we can all recall the last time "words" were used to divide us and install fear. See the full text and comments here. 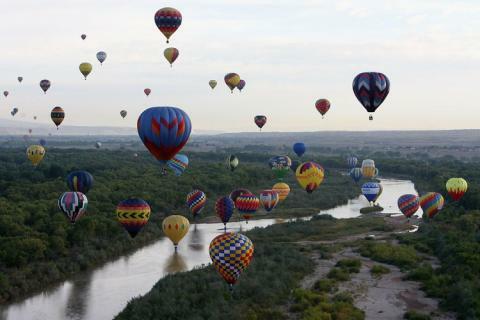 With the deadline for voter registration in New Mexico this Tuesday, we set up a big push to get volunteers to the opening weekend of Albuquerque’s International Balloon Fiesta including the big launch site itself as well as Park-And-Rides bus service locations throughout the city. Our wonderful volunteers rose at 4:30 am to get in position to register voters. If you want to change the world, it looks like you really do have to get up pretty early in the morning. The article was picked up not just by the Albuquerque Journal, The Santa Fe New Mexican and local news stations like KOB, but numerous media outlets all over the country including Newsweek, Forbes, USA Today, MSNBC, ABC News, Newsday, Fox News (yes, really), and, my little hometown’s rag, The Washington Post. Heck, here it is in the Taiwan News! 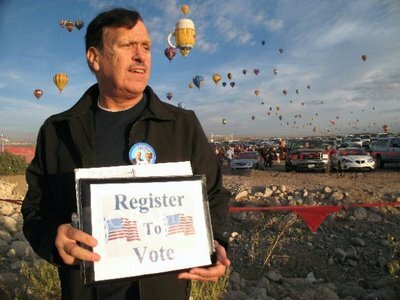 Press coverage is exciting but the real news is the number of new voters we've registered whether at the Balloon Fiesta, our local flea market, CNM’s voter registration drive, UNM’s North Campus, Coronado Mall, Goodwill, Sunflower Market, Target, the Lobo Grower’s Market, the Jewish Community Center and many other local stores, senior centers, high schools and parking lots. I'm intensely grateful to all of our hard-working volunteers who take time out of their personal lives to expand the voting base for Barack Obama and ensure that so many people have a voice in this and future elections. And it’s not quite over yet. Tomorrow is our last full day to register voters and reach our state-wide goal of 30,000 voters in 30 days. From a geographical perspective, Albuquerque is a "big" place (sorta like Alaska) so almost everyone here still drives back and forth to work. New Mexicans love their drive-throughs so we have set up several drive-through locations during evening commute hours for “Last Chance” registration before Tuesday’s deadline. The drive-throughs have worked pretty well so far so we're hoping to catch all of those procrastinators and too-busy-parents with our final efforts.